The Green Bay Packers Upper Sideline includes sections on the 300 level on the home team sideline of Lambeau Field. The Lambeau Field seating chart shows the Upper Sideline above the Lower Sideline seating area and between sections of the Upper Level. Green Bay Packers Upper Sideline seats are split into five sections: section 322, section 324, section 326, section 328, and section 330. The seating area is distinguished by being immediately above the Lower Sideline and every seat in the Upper Sideline provides a great view of the field. While the pickiest fans will want to be in the front rows of section 326 to be on the 50-yard line, any ticket throughout the seating area will provide a terrific view of the game. The front rows of every section provide a view that is arguably better than the Lower Sideline since the added perspective of height makes it easier to watch the action throughout the entire field. Packers Upper Sideline tickets are, like all other non-premium tickets, sold only to season-ticket purchasers. 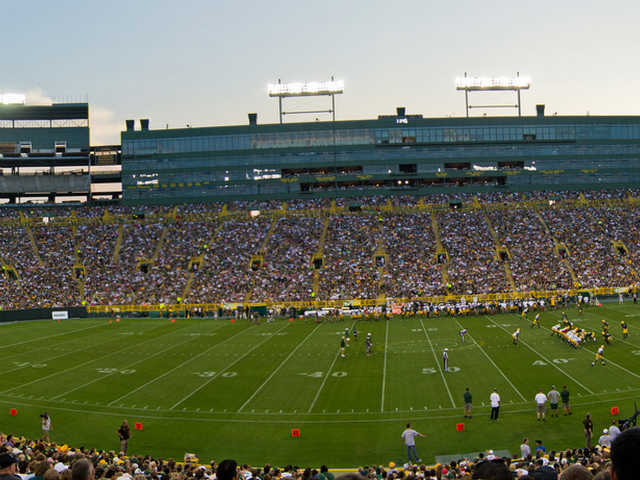 Since the Upper Sideline is one of the most coveted areas in the stadium, tickets are never available as individual game tickets from the Packers ticket office. Purchasers looking for single game Upper Sideline tickets should shop at independent ticket brokers and Packers ticket sellers. Although the Upper Sideline is next to the Upper Level, tickets for the Upper Sideline are in very high demand and market prices often exceed multiple times face value.